I ran across this post about the future of interfaces and just couldn't pass up re-posting the videos. Forget your jetpack. This is the future. Yeah, I couldn't think of a reason either. Inc.com - an online version of the business-oriented magazine. I get their daily emails which gives you 5-6 quick news stories in business. They tend to focus on tech and startups. American Express's OPEN Forum - one of my favorite business and marketing news sites. Lots of great stuff here though they do be more focused on small businesses (which is a primary focus of American Express, as a business). A VC - the personal blog of Fred Wilson, a venture capitalist in NYC, with Union Square Ventures. Fred and USV have their hands in a ton of tech startups (including Twitter, SoundCloud, Tumblr, Zynga, Turntable.fm, KickStarter, Etsy, and others). The BeanCast - Not a blog, per se, but one of my favorite podcasts ever. It's a weekly roundtable discussion of recent marketing and advertising news. They usually come from the perspective of small-to-med-sized agencies and companies (rather than the stuck-in-the-mud giant, corporate guys that populate much of the AdWeek news cycle). Seth. Godin. Is. Brilliant. Every post he writes is pure gold...or at least pretty shiny. Convince and Convert is Jay Baer's blog and personal consulting platform. This guy is one of the foremost thinkers in the burgeoning social media marketing world. Dan Zarrella. If Jay Baer is the Socrates of social media, Dan is the Sir Isaac Newton—a full-blooded scientist. He measures anything and everything about social media and also pulls some pretty amazing insights. Viget (UX agency out of D.C.) has a great series of blogs for anyone in UX, UI, and/or web development. UX Magazine is great for general user experience news and articles. Co.Design is Fast Company's design-centric online magazine. They've usually got some insightful and inspiring posts. There's a whole slew of other blogs I follow for design inspiration but these here are more informational and high-level. Definitely let me know what blogs you find helpful in your business. You can share below in the comments. 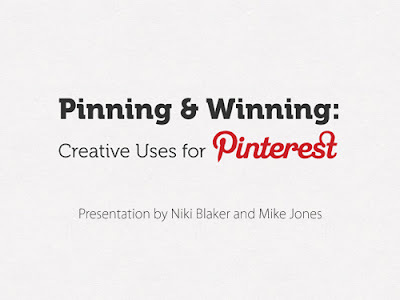 For any that missed the Pinterest presenation Niki Blaker and I gave today at Gangplank, I've got the slides ready as a downloadable PDF. Feel free to download them and share. Tomorrow, Niki Blaker and I will be holding court over at Gangplank HQ for the weekly Brown Bag event. We'll be discussing the new social networking site, Pinterest, looking at how we use the site, as well as how others are using it to be inspired, build connections, and market their brand. If you can make it, hopefully you'll find it helpful in your own creative process (as well as networking and your social media marketing). You can find all the event details and RSVP on Facebook. P.S.S. Get even more design inspiration from these two Pinterest board round-ups that we were recently featured in!